The Fischbowl: Colorado: We're #41! Just a quickie via David Warlick. Now, as I think I’ve made fairly clear on this blog, I don’t think technology is the answer to everything in education, but it is important. And broadband access speed is only one piece of the technology puzzle. But this does make you wonder. As the Internet become more and more important in so many different areas of our lives – including learning – what differences might emerge between students that have 61 mbps download speeds and those with 1.35? 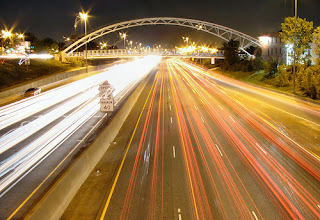 Image Citation: i25 and 15th street, 10:30 pm, originally uploaded by Rob. I don't think it is necessarily the compactness of the country. I'm in New Zealand and I don't know what the average speed is but mine is typically around .9 mbps (I'm supposed to be getting 2 mbs but rarely do.) Goodness me I'd love to get 45 mbs. That would be astonishing. Paul - I was thinking that if a country was relatively small and decided that high-speed access was a priority, they could accomplish that fairly quickly and easily. So a Japan or South Korea would have an easier time than a Canada or U.S. - just a guess, of course. Especially South Korea has such a high tech. It would be so much easier like Karl said. I think your question is a good question and ties into "the Digital Divide," but I see 1.354 as more than adequate. How fast do we truly need things? We already have more and faster access to information than any of our predecessors and I am not convinced that we are better thinkers/reasoners/listeners/users of knowledge. I remember using a 29kbps modem, in fact two years ago I was still connecting at 29kbps with my 56kbps modem, because the telephone lines and local connection service would only allow me to connect at that speed. I have friends who still lives far out in the country that only have dial up access (they could pay for satellite, but it is still expensive) and he gets by just fine. It is true that some aspects of the web are very information intense, but for the most part we are looking at mostly text. Videos and pictures are great, but there are so many things that we already have to pick and choose what is right for us. I guess what I am saying is, you can not have everything. It may be more valuable to focus on what is pertinent. We need to learn skills to pick out what is the most important from all these different information resources and we also need to be patient. Increased speeds do not mean we will have better content or better material to look at. Still it is very interesting to see such disparities. I too wonder at the validity of those numbers and what is not being accounted for. Perhaps there are trade offs we are not seeing. daver – I agree that our students need to learn skills about how to find, evaluate and process all this information, and that we need to work on their critical thinking skills. But I think I would have to disagree with the notion that speed isn’t relevant. Here are a few thoughts. First, I was thinking in terms of education, not “deals,” but I think we should keep in mind that all those “brick and mortar” shops have the current prices they do because of the Internet. Business and the global economy have been utterly and irreversibly transformed by the Internet. I won’t go into it here, but we had a panel of eight business leaders meet with our teachers at the end of May and they were unanimous in their opinion of how the Internet had changed their businesses, and how they do business, and how their employees did their jobs, and where their employees were located, and on and on and on. And that global, high-speed networks were the catalyst for those changes (see The World is Flat for the backstory on that, even if you don’t agree with everything Friedman says). I have had dozens and dozens of conversations over the last few years with folks that have transitioned from dial-up to broadband, and almost all of them have said something very similar. When they were on dial-up they used the Internet for certain things, thought it was great, but really didn’t see why everyone thought it was such a big deal. And then they got broadband, and the way they used the Internet changed completely. They simply did things they didn’t even dream of doing when they were on dial-up – in fact, did things they didn’t even know existed when they were on dial-up. The Internet went from something they set aside time to “do,” to something that was always there – to be used any time and for any reason, practically indispensable to almost everything they did. It’s a huge difference that I’ve seen in people’s personal lives and certainly in school. I think it’s really hard to place a value on time but, for me anyway, time is critical. Let’s say a particular web page takes about 30 seconds to load at 1.3 mbps. It will take less than 1 second to load at 61 mbps. Some folks look at that and say, “So, that’s 29 seconds. What’s the big deal?” I say it depends on how important time is to you, and how often you perform that task in a day. For some folks, that saves them 29 seconds a day. For quite a lot of other folks, that saves them 25 to 30 minutes a day (or more). For me, and for a lot of folks I know, 25 to 30 minutes a day is a pretty big deal. And, as the technology and our uses of it get better and better, the type of “content” that can be delivered will also evolve – and require greater and greater bandwidth. Those without the bandwidth will effectively lose access to the content. For the students at our school, the Internet is not just about access to textual information. First, they are being both consumers and producers of a variety of digital content, from video to podcasts to videoconferencing to whatever. They are using many applications like Google Earth, Skype, Google Docs, Blogger, wikispaces, del.icio.us, Google Reader – and on, and on and on – that require reliable and fast connectivity to the web. Access speed for them is a productivity issue – it allows them to do their jobs effectively and efficiently as learners. Second, and I doubt I’ll be able to do this justice, but – for me – the Internet is not primarily about access to information. Sure, that’s a part of it, and a good thing, but that’s not the part that really gets me excited. The Internet is allowing us to break down the walls of our classrooms. It’s allowing our students to work collaboratively on a global basis. It’s allowing them to build their own learning networks – networks that don’t solely depend on the quality of the teacher, the curriculum, and the funding structure in their local school. It’s not just about the information; it’s about the connectivity and the conversation. And faster access speeds allow that learning network to be much more robust and to include so much more than just static text. Saying “videos and pictures are great” and then dismissing them is like saying “three dimensions are great, but aren’t two good enough?” Humans aren’t just text – and the connectivity that the Internet is enabling isn’t either. And keep in mind – we’ve only just begun to figure this out. The Internet is really only about 12 years old in terms of popular knowledge and use of it (about 1995 is when it hit the public), and much younger in terms of educational use in most schools - we’re still figuring out ways to use it. And we haven’t seen anything yet in terms of the technical capabilities – we’re in the midst of exponential increases in technical capability that our linear brains really don’t know how to envision.